Feb. 11, 2019, © Leeham News: Airbus acquired 50.01% of the Bombardier CSeries program last year. Boeing and Embraer Commercial Aviation received Brazilian government approval last month and now await a nearly-year long regulatory approval process from around the globe. Based on the announced orders at Jan. 1, Airbus has a 78% share of the 100-150 seat sector following the combinations. Embraer sold more airplanes in this sector than Boeing: 95 E195-E2s to 70 737-7s. The former CSeries has 526 orders to 55 for the A319neo. 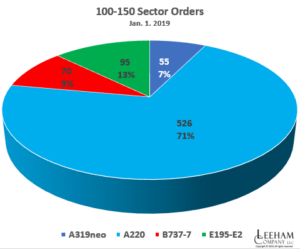 14% of the A220 orders are classified as “Red” in LNA’s judgment—orders that either should be removed from the backlog or, in one case, is highly questionable due to customer statements. Another 11% of the A220 orders are classified as “Yellow,” primarily due to region risk. Synergies between A220 and A320 are greater than E2 and 737. May 28, 2018, © Leeham News: Bombardier and Airbus may clear regulatory approvals next month, allowing for consummation of the latter’s acquisition of 50.01% of the CSeries program. If all works, this will be well in advance of the Farnborough Air Show that begins July 15. Industry eyes will be on the FAS to see what orders might be announced by Airbus for the CSeries, which reportedly may be renamed the A210 and A230 for the CS100 and CS300 respectively. As May fades to June, Bombardier has beefed up its skyline quality, but there are some orders that are in doubt, including a big one for 40 airplanes. No sales since Dubai Air Show. Airbus-CSeries deal expected to close next month. Three questionable orders affect nearly 20% of backlog. Farnborough Air Show will be keen to watch for news. Two of the Big 3 Middle Eastern carriers launched a PR counter offensive in Washington DC today. Below are my thoughts. I haven’t weighed in on the current battle between the Big 3 US airlines and the Big 3 Middle Eastern carriers because it’s largely beyond the scope of LNC. But I like commercial aviation history, so I thought I’d bring up a little. Frontier sold to Franke group; what of Republic CSeries order? 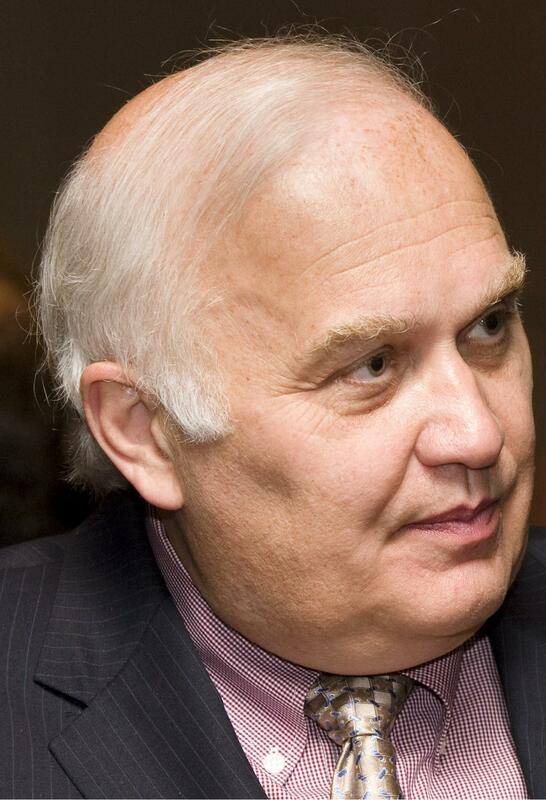 It had become one of the worst-kept secrets: Indigo Partners, the investment group managed by Bill Franke, former CEO of America West Airlines, has purchased Frontier Airlines from Republic Airways Holdings. Frontier assumes all the Airbus A320neo family orders outstanding. Franke’s Indigo bought controlling interest in Spirit Airlines and transformed it into an Ultra Low Cost Carrier. Indigo sold its shares months ago and Franke and an associate resigned from the Board of Directors, and from then on speculation was rife Indigo was gearing up to buy Frontier. Frontier CEO David Siegel has been transforming Frontier into an ULCC, but Franke is likely to take to concept further. Republic was the launch customer for 40+40 Bombardier CSeries, Inevitably, questions will arise over the future of these orders, since these were assumed to be for Frontier. Our information is that Republic has plans for these airplanes apart from Frontier. 787 Developments: There have been a flurry of developments late Friday on the Boeing 787. First, it emerged that Boeing’s Charleston plant will not reach a production target of three per month by the end of this year as Boeing repeatedly said. The Charleston Post & Courier first reported the story, and the Puget Sound Business Journal picked up on it Friday. “If anyone was under the impression that Boeing South Carolina would be at three per month by the end of this year, they didn’t understand what we’ve been saying about the surge line in Everett helping us to meet the program-level rate as the facility there comes up in rate. That’s been our message for a long time now,” the Boeing Charleston spokesperson told the P&C and Everett told the Business Journal (via two different spokespersons). This was really quite a pissy official statement from Boeing. But when confronted with Boeing’s own October 2012 release stating that the North Charleston operation would hit three monthly by the end of this year, as well as a 2012 interview with North Charleston site director Jack Jones, in which he said he expected to hit an even-higher 3.5 monthly rate by the end of this year, the Boeing communications team backed down. This is an embarrassing display from Boeing. Since the surge line had been put over to rework, we wonder its current status. Second, The Wall Street Journal, followed by The Seattle Times, reported that Canada’s regulators are about to issue an Airworthiness Directive concerning Honeywell’s Emergency Locator Transmitter; and that there was a part that should have prevent the ELT from overheating in the event of a short circuit. Frontier as a ULCC: The consultancy CAPA has an analysis of the prospect of Frontier Airlines moving even more in the direction of becoming an Ultra Low Cost Carrier than it has already. Fixing Ethiopian’s 787: The New York Times has a good article on the challenges of fixing Ethiopian Airlines’ Boeing 787. Pricing the 777X: The Wall Street Journal has an article about Boeing’s challenge of pricing the 777X. It’s via Google News, so it should be available to all Readers. Indigo and Frontier Airlines: Sounds to us like Indigo is gearing up to be Frontier Airlines’ new owner. MIRAMAR, Fla., July 29, 2013 (GLOBE NEWSWIRE) — Spirit Airlines, Inc. (Nasdaq:SAVE) announced today the public offering of 12,070,920 shares of common stock by certain existing stockholders affiliated with Indigo Partners LLC (“Indigo”). Upon completion of the offering, investment funds affiliated with Indigo will no longer own shares of common stock of Spirit Airlines. The company will not receive any proceeds from this offering. Barclays is acting as the sole underwriter for the offering. The shares of common stock are being offered pursuant to the Company’s existing shelf registration statement filed with the Securities and Exchange Commission (the “SEC”) on July 31, 2012. A final prospectus supplement describing the terms of the offering will be filed with the SEC and, when available, may be obtained from the SEC’s website at www.sec.gov or from Barclays Capital Inc., c/o Broadridge Financial Solutions, 1155 Long Island Avenue, Edgewood, NY, 11717, Telephone (888) 603-5847 or by e-mailing Barclaysprospectus@broadridge.com. In connection with the offering, the Company also announced that Messrs. William A. Franke and John R. Wilson have informed the Company that upon completion of the offering, they expect to resign as directors at the next board meeting, presently scheduled for August 7, 2013. Upon Mr. Franke’s resignation, the Company’s board intends to elect Mr. H. McIntyre Gardner, a director since 2010, as Chairman of the Board. The FAA has released a list of air traffic control facilities that could close with Sequestration, which is due to take effect March 1. The FAA warns that passengers at TSA lines could be up to three hours and tarmac delays at major hub airports could be up to 90 minutes. There’s clearly huge demand for the 787. There was a lot of excitement about it, but Boeing was heavily promoting the 747-8, for which the company is certainly seeking more orders, with few orders for the passenger version and the air freight market being very weak. To date, the majority of orders for that airplane have been freighter orders. This is a relatively small program, but we think it is the most difficult within Boeing’s portfolio right now. …[Y]ou’re probably not going to see the growth that Boeing had once hoped for there. That’s certainly how we have been making assumptions, as well. Alaska, Frontier and Competition: The Centre for Asia Pacific Aviation has this analysis about Alaska and Frontier airlines, which aside from being a little geographically-challenged, is one of CAPA’s usual well-researched and thought-0ut looks at airlines. (In fairness, CAPA often strays from the Asia-Pacific, but we couldn’t resist the quip.) CAPA now actually calls itself Centre for Aviation. A380 Repair Costs: Aviation Week has this article detailing the costs to Emirates Airlines for repairs to the Airbus A380 wing bracket cracks. Boeing Labor Challenges: Boeing seems headed for war again with labor unions. Here’s an article from The Everett Herald with several links within it; one from MyNorthwest.com about SPEEA; and one from The Seattle Times about SPEEA. Cargolux and Qatar: We posted some news about Cargolux and Qatar yesterday; The Seattle Times has this piece about the threat to the Boeing 747-8F from Cargolux’s problems. With the announcement by Alaska Airlines for 20 737 MAX 8s, 17 737 MAX 9s (and 13 Next-Generation 737-900ERs), Airbus and Boeing continue their battle for the US market. There are still a number of customers who have not ordered either aircraft. US Airways has been exclusively an Airbus customer. Airbus lost a hard-fought battle to Boeing in the competition for the A321-737-900ER order. ILFC orders seem to be on hold pending its Initial Public Stock offering. Busted. We’re a big fan of the Discovery Channel’s Mythbusters. In the warped sense of humor department, we found this to be pretty amusing, since nobody got hurt. TSA: Anyone who has flown in the US knows that the airport experience is probably the worst part of traveling. It’s worse than the abominable on-board service now provided by most US airlines. It’s worse than the crowded airplanes and the cramped legroom. TSA’s use of body x-ray machines is invasive. The 3-1-1 rule about liquids is absurd and the requirement to remove shoes before going through magnometers is silly. In Europe, the body x-ray machines we’ve been through (and we had no choice for an alternative method) are less objectionable. The particular machine at Delta’s Amsterdam connecting gate was a stick figure, not an x-ray of the body itself. The stick figure shows dots where “something” appears and the security person did a quick pat-down of these locations. Much less invasive than the TSA. And the shoes stayed on. This actually was the first body scanner we went through since they were introduced and because it was a stick figure, we had no objection. Business Week has this article talking about the TSA and its silly policies. Boeing spent billions designing the 787 (we’re thinking only of the standard expense here, not the overruns) to dramatically improve the passenger experience, and it did a very good job. And Boeing is spending lots of money to aid airlines in training, to reduce in-flight fuel expenses and to improve the air traffic management systems. Too bad it can’t control what the airlines do with the interior, but even that isn’t the real challenge: it’s the airport experience.